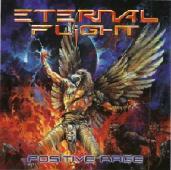 Eternal Flight is by far one of the most uplifting metal bands to come down the pike in a very long time. Despite the fact that this outfit plays the kind of power metal usually relegated to songs about dungeons, dragons, swords and sorcerers, this French outfit is equipped with both lyrics and an attitude that emanate all-around good feelings. Eleven tracks of Primal Fear-meets-early-Queensryche, majestic-yet-operatic metal is what you'll find on "Positive Rage" -- and with a sunny outlook to boot. If you like your metal progressive (a la Dream Theater) with power metal parts which fans of both Nevermore and Helloween would appreciate, then this quintet is for you. For more information, check out http://eternalflight.free.fr/.